I like bugs, and spiders, but I’m not a bug collector. I’d feel too bad with killing them, so I take photos instead. 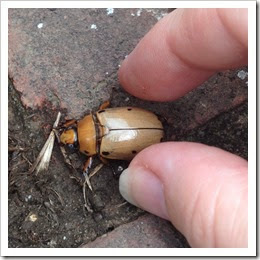 Here, I saved this Spotted June Bug from a jar of water in the back yard. It’s also called a Grape Vine Beetle, but oddly enough, its not a pest. Supposedly, they don’t cause enough damage, which seems to be true. We don’t have an issue with them. This guy is gasping because he was nearly drowned. I let him be, and later found he was gone. When having trouble identifying things, I sometimes use the Noah Project site. It’s a brilliant idea where the site uses members to create a global community of nature lovers who will help document species all over the world. You can join ‘missions’ to look for butterflies, spiders, or flowers, and earn badges as well. I only have the Tadpole badge for now. 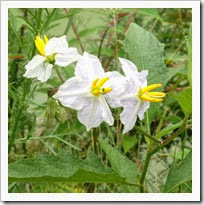 It’s a Carolina Horse Nettle. 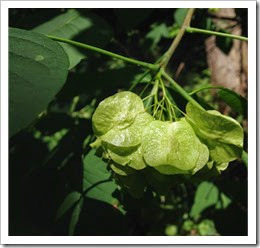 Its also called sand-brier and devil’s tomato. Don’t let the tomato reference fool you- this is a poisonous plant, and considered a weed. I still think its pretty, though. This was a small tree, (shrub) known as a Wafer Ash, or Hoptree, known for being rather fragrant. I didn’t smell anything. I found the seeds rather interesting though. Due to its fragrance, gardeners add this to their yards to attract butterflies. Historically, its also been used to make beer. And here we have Lazyous Kittyous, or the Lazy Cat, aka Max. 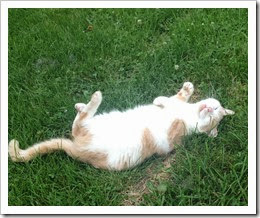 He’s enjoying these summer days in the back yard. I took this photo while brushing the dog and looked over to find Max doing this. Yeah, cute. He wanted to be brushed too, and waited for his turn.